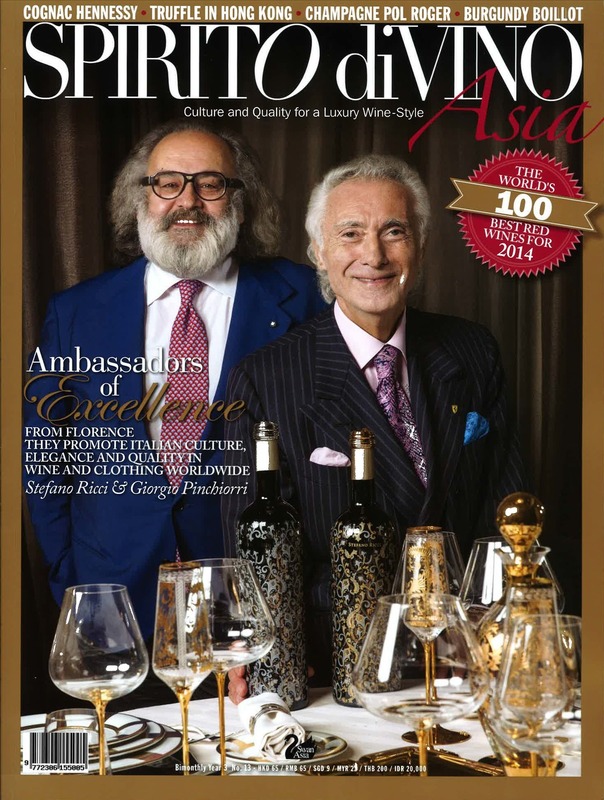 As we saw in the last issue, style is the personality of the wine. Quality on the other hand is concerned with “the degree of excellence” the specific wine has achieved in comparison with others of the same style. It comes from the vineyard and whether the producer has achieved what he/she set out to achieve in the winery. 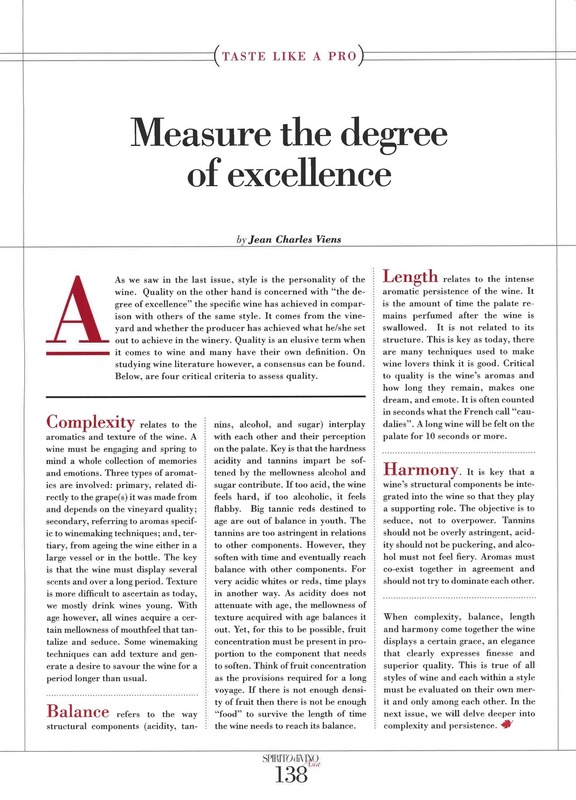 Quality is an elusive term when it comes to wine and many have their own definition. On studying wine literature however, a consensus can be found. Below, are 4 critical criterions to asses quality. Complexity relates to the aromatics and texture of the wine. A wine must be engaging and it must spring to mind a whole collection of memories and emotions. Three types of aromatics are involved: primary, related directly to the grape(s) it was made from and depends on the vineyard quality; secondary, referring to aromas specific to wine making techniques; and, tertiary, from ageing the wine either in a large vessel or in the bottle. The key is that the wine must display several scents and over a long period. Texture is more difficult to ascertain as today, we mostly dink wines young. With age however, all wines acquire a certain mellowness of mouthfeel that tantalize and seduce. Some winemaking techniques can add texture and generate a desire to savour the wine for a period longer than usual. Balance refers to the way structural components (acidity, tannins, alcohol, and sugar) interplay with each other and their perception on the palate. Key is that the hardness acidity and tannins impart be softened by the mellowness alcohol and sugar contribute. If too acid, the wine feels hard, if too alcoholic, it feels flabby. Big tannic reds destined to age are out of balance in youth. The tannins are too astringent in relations to other components. However, they soften with time and eventually reach balance with other components. For very acidic whites or reds, time plays in another way. As acidity does not attenuate with age, the mellowness of texture acquired with age balances it out. Yet, for this to be possible, fruit concentration must be present in proportion to the component that needs to soften. Think of fruit concentration as the provisions required for a long voyage. If there is not enough density of fruit then there is not be enough “food” to survive the length of time the wine needs to reach its balance. Length relates to the intense aromatic persistence of the wine. It is the amount of time the palate remains perfumed after the wine is swallowed. It does not related to its structure. This is key as today, there are many techniques used to make wine lovers think it is good. Critical to quality is the wine’s aromas and how long they remain, makes one dream, and emote. It is often counted in seconds what the French call “caudalies”. A long wine will be felt on the palate for 10 seconds or more. Harmony. It is key that a wine’s structural components be integrated into the wine so that they play a supporting role. The objective is to seduce, not to overpower. Tannins should not be overly astringent, acidity should not be puckering, and alcohol must not feel fiery. Aromas must co-exist together in agreement and should not try to dominate each other. Wine literature often refers to Ageing Ability, Intensity and, Typicity as elements of quality. However, these are debatable. Today 95% of all wines are made to be drunk within one year of release. Especially whites. As for intensity, many of the best wines are delicate and subtle on the nose however with tremendous complexity and intricacies. These are often described as elegant and gracious. Finally, typicity is important, but many a producer will be proud to demonstrate that their wines demonstrate specificity of their particular “terroir” rather than being “typical” of their region. When complexity, balance, harmony and length come together the wine displays a certain grace, an elegance that clearly expresses finesse and superior quality. This is true of all styles of wine and each within a style must be evaluated on their own merit and only among each other. In the next issue, we will delve deeper into complexity and persistence.